Sunny and her co-stars in traditional European costume filming for a recent episode of Invincible Youth 2 + a bonus pic of Hyoyeon romping in at the end. Sunny’s selca pic with T-ara’s Hyomin who’s making a special appearance on a recently filmed episode of variety show Invincible Youth II. 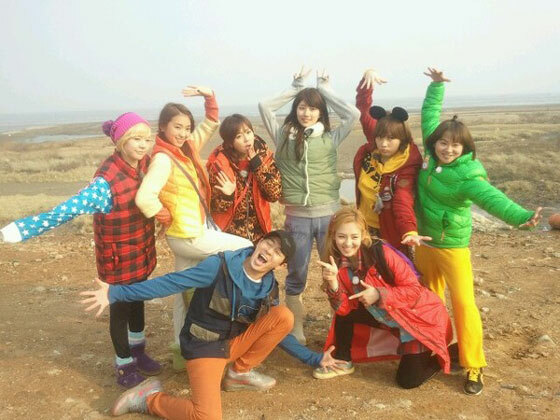 Sunny’s screen captures from April 14th episode on Invincible Youth II. SNSD’s Hyoyeon & Sunny together with other Invincible Youth II members and also comedian Kim Shin-young (right) who is back with the KBS TV variety show. HD fanpics of Girls’ Generation’s Hyoyeon from an Invincible Youth 2 event on January 18th. Click image for full resolution (1280×800).